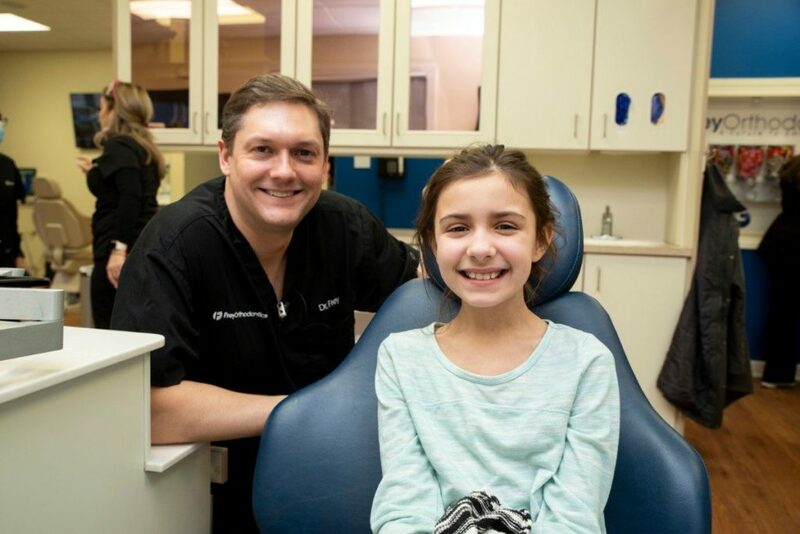 Did you know that as an orthodontic patient with Frey Orthodontics, you play a key part in the success of your treatment? In fact, the entire orthodontic experience is a team effort that includes you, our team, and your general dentist. All of us working together will give you a beautiful smile and improved oral health at the end of the treatment process! One of the most important things you can do to ensure the best results is maintain a good oral hygiene routine. This is one of the most crucial elements of braces care, and though it may take a little extra time and effort, it will be more than worth it once your new smile is revealed. Let’s take a closer look at how to keep your teeth and gums clean, healthy, and free from bacteria while you’re in braces! The bacteria in plaque can react with the sugars and starches in food, and form an acid that eats away at the enamel on your teeth. This can leave white marks on the teeth, cause cavities, and even lead to gum disease over time. In addition, when plaque is allowed to accumulate around your braces, it can leave stains on your teeth we call decalcification. The lines and spots that come from decalcification are permanent. Periodontal disease, more commonly referred to as gum disease, is caused by the buildup of plaque on the teeth and generally occurs in three stages. The first stage is gingivitis, in response to plaque accumulation irritating the gums. In response, they may be puffy, swollen, or bleed slightly when you brush or floss. If gingivitis is left untreated, the buildup of plaque can harden into a substance called tartar. As tartar accumulates, gaps or pockets may form between your gums and teeth, allowing even more tartar to collect in these pockets. This is the second stage of periodontal disease, called periodontitis. Eventually, pockets of bacteria can form and go deeper beneath your gums, attacking and ultimately destroying the bone that holds your teeth in place. This advanced periodontitis can cause even healthy teeth to loosen or fall out, and is the third stage of gum disease, as well as the most serious. With professional help from an experienced dentist, and good follow-up care at home, early gum disease is usually reversible. However, ignoring it can make it worse. Because gum disease is often painless, you will need to be alert to any signs of it while undergoing orthodontic treatment. That includes, such as bleeding, swollen, or puffy gums. By carefully following Dr. Frey’s directions on how to care for your braces, you can help keep plaque, bacteria, and tooth decay at bay! While a good oral hygiene routine helps all of us prevent common dental problems, it becomes especially important when you are undergoing orthodontic treatment like braces. As you probably already know, this can sometimes be complicated by the brackets, wires, and bands. These components can trap food debris and make cleaning your teeth and gums effectively a bit challenging, especially in the early days. Yet without the proper care and attention, dental issues can and often do develop. These issues can be frustrating enough to deal with on their own, but they may also cause secondary oral health issues when left untreated over time. This can extend the total time spent in braces, and in more serious cases, braces may need to be removed while we wait for any mouth and gum issues to be resolved before continuing the treatment. To avoid extending or delaying your treatment, try incorporating the following tips into your daily oral hygiene routine! Braces often mean adjusting both the way you brush your teeth and how often you do it. You should be brushing your teeth with a soft toothbrush after every meal, and preferably after every snack, for at least two minutes each time. This will help keep food particles and plaque from getting a foothold in your braces and teeth. To properly clean the brackets, you should angle the brush head against them, and be sure to brush thoroughly under the wires as well. Slide a piece of floss about 18 inches long under the wire, above the space between the two teeth. Insert the floss halfway through, and then hold both ends of the floss. Carefully slide the floss up and down a few times between the teeth. You’ll hear a slight squeaking sound when it’s thoroughly clean. Floss the gum line with the floss in the shape of a “C,” and below the gum line with a soft up and down motion. Be careful not to apply too much pressure when flossing around the archwire. The whole flossing process may take up to 20 minutes in the beginning, but be patient – your speed will increase with practice! There are also products designed to make this an easier process. “Threader floss” has a stiff end that permits flossing between brackets, and an orthopick is a sturdy flosser that easily slides between the teeth and the bracket wire, removing debris and keeping your teeth clear of bacteria. An electric toothbrush and oral irrigator also offer more power and better reach, making dental hygiene much easier and much more efficient. Taking the first step towards a healthier smile with braces is exciting, but we know it can come with its own set of challenges, too. You’ll probably find yourself having to make a few adjustments as you go, but caring for your braces will be second nature before you know it! Frey Orthodontics has a talented team dedicated to making your orthodontic process as stress-free and rewarding as possible. If you’re in Naperville, Algonquin, or the surrounding areas and want to know more about caring for your braces, get in touch with us and we’ll be happy to help. Your happiness and confidence in your treatment are as important to us as giving you a healthy, beautiful smile!